Windows XP: to upgrade or not to upgrade? Back in April, Microsoft’s Windows team began reminding customers that the company would discontinue support for the Windows XP operating system in a year’s time. As of April 8, 2014, customers and partners will no longer receive security updates for Windows XP, or get Microsoft tech support for Windows XP. I’d be a lot more willing to “upgrade” if Microsoft didn’t make it such a schlepp to do so. For one thing, one might find that a new version might not run on one’s existing hardware, so that’s a lot of extra expense right there. Then there’s the schlepp of reinstalling a lot of software. First you have to find the original discs from which you installed the software, and that can take quite a lot of time. Then you find that you’ve updated it several times since you first installed it, and that can take yet more time. Then you find that the “upgraded” operating system comes with little or no documentation, so you have to traipse from bookshop to bookshop to try to find third-party documentation, and eventually, at the fifth shop you go to, you find Windows Whizz-Bang11.35 for Dummies and lash out as much as you paid for the upgrade itself to buy it, and spend hours looking for the information you are seeking (like how to set the PATH to make your batch files work) and find that it still doesn’t tell you. And until you find that piece of information you have to spend an hour each day transferring data files one by one from desktop to laptop and back again instead of simply typing the name of a batch file and letting the computer do the work. When I upgraded from Windows 98 to XP (because the motherboard on my old computer died) it took about a year to get my computer working properly again. And there is still a lot of disk space taken up by software that doesn’t work because I haven’t reinstalled it in Windows XP yet. And then there’s the uncertainty about whether ones software will work at all with an “upgrade”. When my XP laptop was stolen, I replaced it with one that had Windows 7 pre-installed — the 64-bit version. I found most of my data was inaccessible because it would not run MS DOS programs. Fortunately it came with a DVD with the 32-bit version, so I was able to install that, and then the programs worked, but three years later the screen icons still show blank white squares, while with Windows XP I can put pictures in them. So one of the problems with “upgrading” is that I fear losing access to my data — stuff that I have collected over the last 30 years. And if “upgrading” means that I have to start itn all from scratch, well I’m not going to live that long, am I? This “upgrading” is a huge schlepp, and not just the operating system. Some days I can’t work on my computer for an hour or more because it wants me to update my browser, and Flash-Player (which is disabled most of the time anyway) and this reader and that add-on and that widget, and something else — and all this before I can start my computer to look up a phone number or something. I keep hoping that computers were made for man, not man for computers. But “upgrading” swiftly dashes those hopes, and means I have to spend hours and hours and days and months working for my computer instead of my computer working for me. Yes, the possibility of a virus means that there is a risk that you will have a lot of schlepp getting your computer working properly again. But with an “upgrade”, there’s no risk, it’s an absolute certainty. If Microsoft want us to “upgrade” they need to devise a simple way to install the new operating system, and have it update the registry so that it can find all the installed programs and have them work right after installation of the operating system, without having to reinstall them one by one. If they did that, I bet a lot more people would be willing to upgrade. And if the new operating system is so superior to the old one, then the software wizards at Microsoft could surely find a way of doing that, instead of filling the “upgrade” with useless bells and whistles. Thirty years ago I got my first computer. It was a NewBrain, which I had seen demonstrated at an exhibition of educational technology, Instructa 82, in Johannesburg. Quite a lot of microcomputers were on show there, and the most popular micro computers in those days were the Sinclair ZX 81, Atari, and the Commodore VIC 20, which I’d also read about in computer magazines. I’d never heard of the NewBrain before I saw it demonstrated, but it seemed to have a better specification than most of the other computers at the show, and also claimed to be expandable. It had 32k of RAM, which was enormous for those days, and a built in one-line display. It could also be connected to a TV, for a full-screen display, and programs and data could be stored using an ordinary cassette tape recorder. The guy from the agents who sold them in South Africa delivered it to our house in Melmoth, Zululand, and we began to play with it, and so entered the computer age, and a different way of doing things. I was interested in computers mainly because I thought they had potential for recording family history. We’d been interested in family history and genealogy for about 8 years, and had accumulated enough material in files to make it difficult to remember what we had and where we had found it. It seemed to me that computers would be ideal for keeping track of such things, but until the advent of microcomputers such things were only available to medium and large businesses. I began reading computer magazines to see what was possbible. 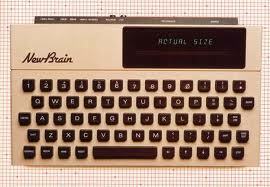 And the NewBrain, with its capacity for expansion, seemed to be the best starting point. It had lots of ways of connecting to other computers. To begin with we just tried to learn how it worked, using its built-in BASIC programming language. There were a couple of elementary game programs listed in the manual, and we invented a few more. One of the things we did was to do random PEEKs and POKEs to different memory locations, and then ran the program to see how long it ran before it crashed, and what appeared on the screen in the meantime. I suppose it was the equivalent of giving the computer an epileptic fit. Since the BASIC was in ROM it could not harm the machine, and all one needed to do was to switch it off and on again to start again. But that is not something to try on a computer with a hard disk — it might do permanent damage. The expanded NewBrain, with disk controler and memory expansion sitting behind the main box, a proper monitor (not just a TV screen) and the two floppy-disk enclosures on the right. Eventually we expanded the NewBrain — there were two other boxes, about the same size as the original box, which plugged into the back of it, and sat on top of each other — a memory expansion module and a disk drive controller. The memory expansion module expanded the memory to about 128k, and the disk drive controller enabled us to connect two 180k mini-floppy disk drives. It used the CP/M DOS, which was quite popular in those days. The main problem was that just about every brand of micro-computer had its own way of formatting floppy disks, and so disks that were formatted in one make of machine could not be read or written to in another. I read in computer magazines about a genealgy program for microcomputers, called Roots/M, but one could not get it on NewBrain format disks. Eventually I got a database program called Superfile which ran on the NewBrain, which was quite versatile, and enabled me to do some useful work. For me, databases are the most useful app, and the ability to put information into the computer and get it to spit it out again has been the thing that has made the biggest difference in my life. The trouble with the NewBrain was that it was expensive. The two floppy disk drives cost over R1000 each, which is about R10000 in today’s money. Now you can get a couple of 2 Terabyte drives for the same price, in today’s money. But the NewBrain got us started, and long after we had replaced it with more powerful computers our children asked if we could get it out of the cupboard so they could play with it, and learn BASIC programming. So it was an aid to computer literacy as well. And there is something sad about the progress that has been made, too. Nowadays, with GUIs like Windows, Gnome and KDE, there is virtually nothing useful that one can accomplish by tinkering around with amateur programming. Except that I think it might be worthwhile trying to learn to do something with AWK. It might just be possible to have some fun and do something useful with it as we did with BASIC thirty years ago. One other thing astounded me. We still have our NewBrain. It’s stashed away in a cupboard somewhere, but it would be a bit of a schlepp to get it out to take a photo of it to illustrate this post. So I took a chance and did a Google search for a picture of a NewBrain, without much hope of finding one. But it popped up immediately, and I found that not only are there pictures of them on the web, but some people actually still use the things, and write software for them, and there is even a NewBrain emulator for running on other computers. So if you want to know more about the NewBrain, you can look here and here. There was also a rather nice game for the NewBrain. It was written by the South African distributors, Avisa, and they spent almost as much time writing the copy protection module as they did on the game itself. The game was called Mazeland and it came on a copy-protected cassette tape. One had to travel down a maze through various levels battling ever more powerful monsters. There was a similar game for MS DOS computers, called Rogue, but Mazeland was better. We never actually finished it, because someone nicked our tape recorder with the cassette still in it. One of the most powerful monsters we encountered was called a Nothingness, and it would say things like, “The Nothingness has hit you 238.984506 times”. It needed more imagination than the graphics-intensive games of today. Why do people have to name computer programs or web services with ordinary words? I’m referring to things like Ubuntu and Android, and one I heard of just today, a social networking thing called Diaspora. If you are looking for web sites related to ubuntu, or androids, the search engines spew out many totally irrelevant posts. Computer programs or web sites with unique made-up names have less danger of ambiguity and confusion, like Linux, Facebook, Orkut and the like. Ok, “twitter” is a word, but it’s not one that people would really want to look up other than the web site. This is my first blog post on my new hardware, so it’s a kind of test to see if everything is working, and so far it does. My old computer had a 30 Gig and a 40 Gig hard drive, and about 6 months ago I upgraded the 40 Gig one to 500 Gig. It was quite difficult to find one, as most of the hard drives being sold now are SATA, and I wanted an EIDE disk to match the other one. Eventually I found one, backed up all the data on the old drive using Acronis disk imaging software, installed it on the new drive, and everything still worked. This time, however, was more ambitious. The old computer was getting rickety. I dared not switch it off, because it might not restart. If the power went off, I’d have to sit pushing the power button for half an hour before it would run. The CPU fan was also getting noisy, and it sounded rather ominous. So that meant replacing the motherboard, and both hard drives (both now 500 Gig SATA). I’ll see if I can use the 500 Gig EIDE drive an an external housing as a backup USB drive – it’s only about 6 months old. It took me a day to get this far — backing up the 30 Gigs of data on the G: drive took 9 hours, and nearly 2 hours to restore on the new drive. And the C: drive was the critical one, because that had the operating system (Windows XP) — would it work on the new drive? It did. Everything seems to be working fine. The only problem is, Windows thinks there have been too many hardware changes, and wants to be revalidated. If that goes as smoothly as the rest of it, all will be well. Oh, and my printer has a parallel cable, and the new hardware has no parallel port. But perhaps a USB cable will work, or I can nick a parallel card from the old one, if it fits the new motherboard. Someone sends me a “crime report” of crimes that have taken place in our neighbourhood. I’ve thought of saving these in a database that would make it easier to refer to them — to see if a car registration on a vehicle behaving suspiciously has been recorded as being involved in crimes elsewhere, for example. But what deters me is all the extraneous headers in the e-mails. All I want is the to, from and date lines, and not all the routing information and spam checks and the like. And suddenly someone has pointed me to a utility that does just that, for Pegasus e-mail, the mail-reading program I use. And lots of other useful utilities too. Note that none of these utilities has a ‘Setup’ or ‘Uninstall’ procedure. They do not write to the Registry and do not put DLLs etc in other directories. To remove any of these utilities from your system just delete them. I notice that Windows 7 doesn’t have a built-in e-mail system. This is an improvement, since it gives the user a choice of what e-mail program to use, and I use and recommend Pegasus, partly because in its default setup it is immune to a lot of the spam and malicious e-mails that seem to go around. Welcome to the North American Web Site for Pegasus Mail, the Internet’s longest-serving PC e-mail system, and for the Mercury Mail Transport System, our comprehensive range of Internet Mail Server products. Pegasus Mail is a free product, dedicated to serving all who need it, while Mercury is a modestly-priced commercial system. I suppose I am a bit old-fashioned about e-mail: I think e-mail is e-mail and web pages are web pages, and that HTML codes should be kept out of e-mail, and reserved for web pages. Using HTML in e-mails is wasteful of bandwidth and disk space. A two-line message in plain text can take 200 lines or more in HTML, yet the content is exactly the same. So I don’t like HTML in e-mails, and Pegasus lets me send and read message in plain text. Pegasus also, by default, blocks “lazy html”. That is, HTML codes that refer to an external web site and not something in the message itself. It is something most often used by spammers, scammers and distributors of malicious software, designed for more tolerant and less protective mail readers like Outlook and Outlook Express. Pegasus by default blocks them and displays a warning, and anything in the message that refers to a remote site is displayed as a blank grey block. Sometimes such a message will display something like “Your mail reader cannot display this message” and tells me what hoops I need to jump through to read it. But such messages are almost invariably unsolicited spam anyway, which I don’t want to read. you know something phishy is going on. My computer has a demon, it really has. OK, it’s probably a daemon, but it’s a demonic daemon. It takes control of my computer most mornings about 9:20, just when I’m trying to get some work done, and wastes about half-an hour every day. What happens is that the hard disk starts churning, and the computer then takes an age to respond to anything. The only way to gain control again is to press and hold down the power button until the thing stops, and then reboot. But this morning I decided to do it the long way. When I clicked a few times and there was no response, I checked, and sure enough, the disk activity light showed that the hard disk was churning. I’d been viewing a web page, and tried to close it, as I thought it might be trying to send me something long and expensive, like a video. When it took a long time to close, I realised what was happening. OK, so that is 22 minutes, but from the time the problem starts to the time I get back to where I was working and start working agan, it’s more like 30 minutes. It’s possible to save 5-7 minutes by switching off with the power switch instead of going through the close-down but it’s still a long long time. I’m running Windows XP, and if ever I have to replace this computer, I’ll probably be forced to use Vista, which to all accounts is worse. One of the problems is that Windows never tells you what it’s doing half the time. Microsoft don’t see fit to tell you. Press Ctrl-Alt-Del to see what program is running and misbehaving so one can close it down, and there’s nothing there. When you boot up, there are all kinds of “processes”, and I’ve read that you can speed things up by omitting some of them, but how do you know what they do and whether you need them or not? Microsoft doesn’t tell you. There are other things Microsoft doesn’t tell you, or someone doesn’t tell you. Some program, I don’t know which, underlines things it regard as spelling mistakes in some documents. But it underlines some spellings that are correct. So where is it, and can one adjust the settings and update it’s spelling dictionary? There is another (or perhaps the same one) that “suggests” things to use to fill in fields on web pages. The trouble is, it “suggests” every typo I’ve ever made. What is this program, where can one find it, how can one adjust its settings and remove the typos? Are there any fundis out there who can answer some of these questions? Someone I know had a hard disk crash recently, and when her hardware had been repaired, she had a problem “revalidating” the Windows operating system. She tried every available method, but nothing worked. Eventually a friend helped her by loading a pirate version of Windows XP on her computer. It was half the size, booted in half them time, and ran at about twice the speed. It was a stripped down version that was an improvement on the original. Actually for most of my work I’d be quite happy to use MS DOS. The only trouble is that it hasn’t been updated and can’t handle modern hardware — disk drives, controllers, video cards etc. People say use a better OS, like Linux, but I don’t know whether the programs I use most often would run under Linux. I have 20 years of work on my computer, if not more. I really don’t have time to start all over again and redo all that stuff. So perhaps it’s time to exorcise my computer. My daughter has been having probelm with her computer crashing, and said she had tried a new antivirus program called Threatfire. I downloaded it and tried it out — installed it on my laptop — and it slowed my computer down to a crawl, or actually brought it to a halt. The only way to get it moving again was actually to switch it off. It looks as though this program is not so much antivirus, but rather itself a virus. Has anyone used it successfully? Is there a trick to installing it, to get it to work? I think I’m going to do a “system restore”. In the sidebar on the right is a link to a Bravenet Guestbook, which some visitors to this and my other web pages have signed. Unfortunately it no longer works, thanks to Adobe Flash 9.0. Because of the tendency to spam guest books, this one is set up so that postings have to be apporved before they appear — about 90% of them as spam. But I can no longer approve them, because to do so I have to install Flash 9.0. I can read the guestbook without Flash 9.0, but I can’t edit it. And unfortunately Flash 9.0 is a very badly-behaved program, which overwrites my autoexec.bat settings. I’ve installed it a couple of times before, and every time I’ve done so I’ve had to do a “system restore” because of all the things that stop working after I’ve installed it — things that are far more important to me than the dubious benefits of Flash 9.0. So there’s no point in signing the guest book, since I’m unable to approve your entry. That’s progress, as the computer world knows it. I’ve saved this in case I ever have to reinstall Windows! One day all software will be free, is the message at the top of the page, and the author created the page/site after reinstalling windows clean, and outfitting the system with free and open source software. He goes through his installation step by step, and there are user comments under his post, with feedback and other freeware suggestions by users. How to never use a paid program again (aside from Windows). 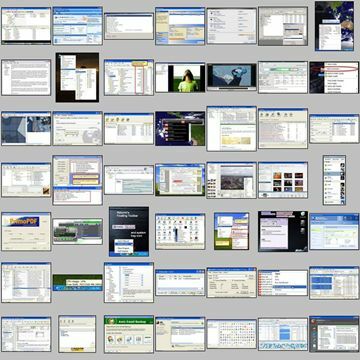 53 essential freeware programs that can take care of the majority of your computing needs. I am writing this from the perspective of myself clean-installing Windows and re-installing all the software I find to be essential afterwards. This post took a long time to write, please Digg and/or Stumble it ;). Post installation: now the fun begins.